Surfacing: Anything to do with Narwhals – Next Hipster Trend is what's HAWT, NEXT! 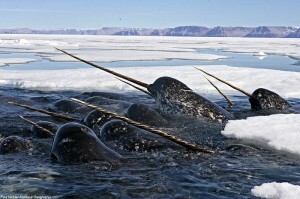 Narwhals have the summertime habit of just lolly-gagging, inactive, at the surface of the sea. Called “logging” this can be considered the animal kingdom equivalent of “planking“. Queen Elizabeth paid the equivalent of 2.5 million dollars for a jewel encrusted Narwhal tusk for her “curiosity cabinet.” Just having a curiosity cabinet or “Wunderkammer” is suuuper hip. Don’t get us started on how Queen Elizabeth represents one of the original metro-sexual hipsters. That’s another article for another day. There are many more reasons why the hip should adopt the narwhal as their clan symbol. But enough “why,” let’s get into the “how.” Firstly, adopt the use of “narwhal,” “narwhalian” and “narwhalling” as both verbs and nouns. “I’m sick of this project not getting done, I’m going to narwhal it!” or “She’s so quiet and narwhally,” your coworkers will look confused at first, but then start using the term themselves, you’ll love this. Second, definitely take up “tusking,” which isn’t, as you might think, listening to the 1979 Fleetwood Mac album over and over, but is in fact the practice of bull male narwhals rubbing their tusks together to simultaneously maintain dominance hierarchies and sensitive sensory organs. You can figure out the ergonomics of this activity on your own, just don’t invite anyone from HR. Finally, in keeping with another hipster trend, form a fraternal organization. Joining ancient animalistic cults like the Elks, Eagles and Owls is Planck hot right now. This actually deserves an article of its own, but suffice to say, the hip should create one themselves called “The Loyal Order of the Noble Narwhal” or some whack thing like that. They could file a 50c3 or something and get non-profit status. Secret noises like clicks and “bangs” could be part of bizarre initiation and drinking rituals. Imagine the silly short brimmed pointy hat involved. Then early into the morning, after most of your friends have gone home from an exuberant night of revelry and tusking, you can look up at the stars imagining yourself floating on your narwhal back, at peace, the unicorn of the sea … even if you don’t know why.